I imagine $52 million for the “Green Lantern” start is lower than WB was hoping for out of a potential franchise-starter but solid enough given the critical thrashing (and seems about right for the film). I totally forgot “Mr. 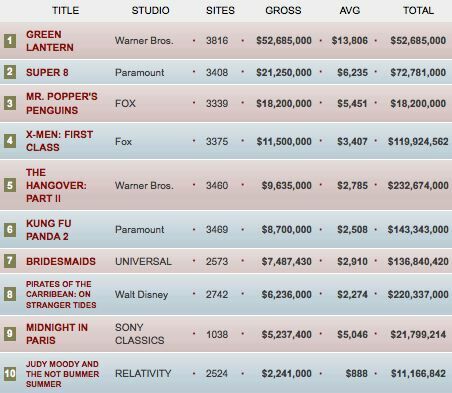 Popper’s Penguins” was coming out this weekend, and so did most others, it seems. “Midnight in Paris” expanded wider than any Woody Allen film to date and keeps chugging, while “Super 8” had a pretty good hold. While I’m sure WB would’ve loved a $60 million opening for Green Lantern, it could have been a lot worse given the months of bad buzz and poor reviews. Also, Jim Carrey’s star power must really be gone if he can’t get a family comedy with animal sidekicks to a $20 million opening. Yeah, it’s not too far off the opening for “X-Men: First Class”, and that had both positive buzz and a well-established toehold in non-comic formats going for it. I finally saw X-Men: First Class. And wow. That even exceeded my high-ish expectations. I really thought it was fantastic (MUCH better than Last Stand or Wolverine). I enjoyed the Hell out of the mutants. McAvoy & Fassbender were, indeed, very good. I was emotionally moved by the lesson Xavier was giving to Magneto when trying to move the dish. And to fashion a story as heavy as Holocaust/Cuban Missile/WWIII and segue it into the X-Men mythology – to me, was highly impressive, and executed smoothly. Decent sized-crowd. Heard positive comments coming out. On the box office, Green Lantern seems mildly disappointing right now, but no disaster. Very nice hold for Super 8, Bridesmaids keeps reeling the public in (good! ), & Pirates is having impressive drops, too (wow). Nice to see Midnight & Tree still doing well, thus far. I saw Midnight in Paris and absolutely adored it. Totally deserves even more money than it is currently making. Read a book, people. Green Lantern cost 200mil for production, 120mil for marketing. 52 mil opening weekend and likely bad legs means this is a disaster. The recent midseason finale of “South Park” summed up “Mr. Popper’s Penguins” perfectly. Nice to see “Super 8” performing well. Shall I get you a sharpener for that axe you’re grinding? I don’t have any axe to grind. I just think that if you’re going to talk about box office you should know what you’re talking about. If they really spent 200 million to make GL and another 100 mil to market it, then that is not solid. … and I was kind of disappointed. The movie is absolutely fine. I enjoyed the cinematography, sets, & costumes. Very evocative. Owen Wilson didn’t annoy me (as he tends to). Marion Cotillard continues to beguile me. I liked Lea Seydoux quite a bit. And it looks like Kathy Bates, Adrien Brody, Allison Pill, Tom HIddleston, & the rest were having fun playing the 1920’s characters. But I simply didn’t care about anyone. Gil? Ehh, he was okay. And his idealistic/nostalgic view of a previous era has been done before. Rachel McAdams’ character was LOATHSOME. Ditto her parents. And nobody was in this 88 minute long film enough for me to grasp onto. It was pleasant, sweet, but thin. All very thin. I did like how it ends. But in usual Woody fashion, the ending comes out of nowhere. And contrary to what others have been saying (whether they love the film or not), I thought it got better as it went along. Overall, a high 2.5 or low 3 out of 4. Definitely fine. Not one of Woody’s best, in my opinion. But it’s very agreeable. Kris, I forget, have you seen/commented on this film already, and what is your opinion? Kris hasn’t seen it yet, though I reviewed it for the site here, if that helps. Saw it tonight and actually loved it. Green Lantern will struggle to turn any kind of profit. It certainly won’t get there theatrically since it probably won’t do that well in international markets. Bad reviews and word of mouth won’t help it any either. Couldn’t be more thrilled to see Super 8 holding on so well. Even though the lens flares were distracting enough to make me want to gouge my eyes out (or J.J. Abrams’), it was a great movie, a nice throwback.. And if it really only cost $50m its success could hopefully pave the way for future summer tentpoles that don’t all cost $200m to make. It now looks like Green Lantern is heading for a pretty steep drop this weekend and an overall end gross in the 115m range (around Ghost Rider). I am curious where DC Entertainment and WB go from here. It’s pretty obvious that post Potter, bringing DC comics to the screen is WB’s #1 priority. We’re already hearing rumblings from Nicolas Refn about Wonder Woman. Maybe Nolan needs to move from directing The Dark Knight Rises and producing Superman to overseeing all the DC properties. A bit of quality control. JJ1: I know from past experience that this is not a popular point to raise, but I think part of the problem with “Midnight in Paris” is that the movie’s theme has no broader context. In his “Dialogue” interview with Mike De Luca, screenwriter Billy Ray notes that the two main problems with movie scripts today are a lack of subtext and a lack of context. By the latter, he means that if you write a movie in 2011 about a man who longs for a previous era, that obsession has to somehow resonate with our culture of the moment. Are we in 2011 a culture that is longing for the past? I don’t see it. If there is no applicable context, you then have to spend screen time establishing expositionally that this particular character is exceptional in some way. And you face the burden of making the viewer care. (Like you, I never did care about the characters in “Midnight in Paris,” and I am the biggest Woody Allen fan I know of.) I had the same reaction to “The Truman Show” and David Finscher’s “Benjamin Button” movie. People don’t age backwards, and if that is a metaphor or allegory for something else in our culture, it escaped me. So I just sat their thinking, So what? The Weir movie was, in a sense, more problematic because it got things exactly backwards: we are a culture comprising millions of boneheads who would give anything to have their lives broadcast on television 24/7. Good points, Frank Lee. Very good. I was still able to enjoy ‘Benjamin Button’, however, because there was such a wealth of beautiful things going on. I liked ‘Midnight in Paris’ just fine, but you definitely touch upon some of my issues with it. Yes, Woody Allen should take scripting tips from Billy Ray, writer of….Color of Night!!! And “The Truman Show” was nothing if not prescient. But you seem to get it totally backwards. Truman didn’t need to crave the spotlight. The point is that the public craved the spotlight for him, living vicariously, avoiding their own lives. The guy in the bathtub is frankly the skeleton key for that movie. It’s a masterpiece. However, if one accepts such a sociological approach, doesn’t the film’s success mean that it in fact is resonating with the “culture of the moment”? I hope they won’t make a sequel of Green Lantern or if they will make it they should remove the main lead (Ryan R.) and the writers in order to achieve success.